Wrist-based heart rate monitors get a bad rap, especially when it comes to the new wave of devices from the likes of Fitbit, Mio and Apple. But Professor Greg Whyte has told Wareable that, in reality, the criticism levelled at wearable and heart rate tracking accuracy is unfair. And while it should be noted that he's an ambassador for Fitbit, Whyte is a highly respected sports performance scientist, a former Olympic athlete and leads the Centre for Human Health & Performance at Harley Street in London – so he has little to gain by spouting any propaganda in his field. "It's very easy to knock wearable tech by saying it's not accurate," he told us in an interview at his lab. "There is a lot of noise on them, but actually there is a lot of noise created by humans – particularly during exercise," he continued. Part of Whyte's service to athletes and patients at his practice is hooking them up to incredibly complex ECG machines to measure fitness. In his lab there's both a bike and treadmill, which can measure blood lactate, VO2 and a host of biometric data. But Whyte says even this technology, used by elite athletes to home their training, is just as fallible to noise. "One of the things that we do in the lab is try and reduce noise," he explained. "We use 12 leads to get an accurate assessment, but we will use abrasives, alcohol wipes before putting the pads on because to improves the skin connection. We hold down the wires and have people on bikes rather than treadmills, so what we're trying to do is reduce the noise." Whyte has seen first hand the differences between the data from top scientific tech and consumer grade wearables. And somewhat surprisingly, he gives the likes of the Fitbit Surge and Apple Watch a glowing bill of health. "For what they are and what they do, wearable tech is incredibly accurate. The signal to noise is such that the data we're getting is quite good." "The more movement is the more problematic that signal to noise ratio is but we get very accurate signals from wearable tech. Are there erroneous signals? Yes of course there are, but we get that clinically as well." We're going to be detailing Greg's training tips on Wareable later this week – but an essential part of heart rate tracking is getting in tune with your resting heart rate. And Whyte explained the importance of tracking your resting heart rate daily. 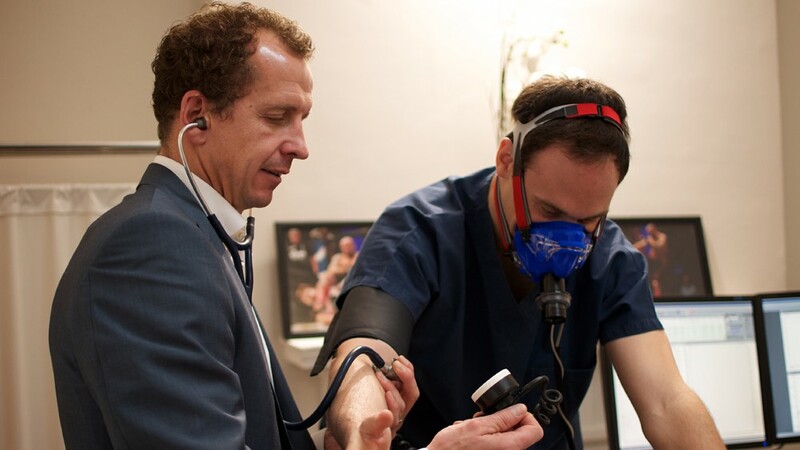 "Resting heart rate is incredibly important as it gives us a global indication of health. We know that if we have an infection, heart rate will rise. That's why there's a normal range between 60 and 100bpm." "Resting heart rate technically is waking heart rate. Before you get up and get out if bed. It's hard to remember to take it, which is why wearables are so useful," he said. "You should measure every day so you can profile yourself across time, so that tells you what your natural permeations are. If you are getting a cold or you are stressed, you can monitor what's happening to your health. In general we're looking for differences 10 beats or more," he said. But what do you do if you notice that over the last week your heart rate has gone up? Well, by taking it in the morning Whyte says you can rule out food or drink, and it's time to start watching other parts of your life. "Changes in waking heart rate is unlikely to be anything to do with diet or caffeine. It's a global assessment of your physical state. If your heart rate is up by a significant amount, what could the cause be?" "If you've been drinking heavily the night before then you know why. If you have had a very poor night's sleep because a of a host of reasons like noise etc, than that could be a cause – and then it might be an issue with your 'sleep hygiene' so your blackouts aren't good, you haven't got the right bed, the right linen. It could be that you're in the middle of exams, buying a house, something stressful in life. "Use it as a starting point, identify what it could be and then address the issues."